Markets erased all of Monday's gains as global markets trembled on rate hike worries. 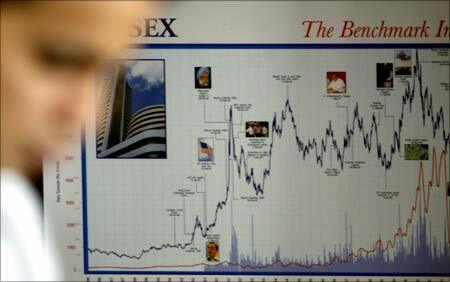 The Sensex opened at 20,372 and dropped below the 20K mark. The index touched a low of 19,832 and finally lost 2 per cent (or 445 points) to end at 19,865. The Nifty also dropped below the 6,000 mark after 11 trading sessions. The NSE benchmark index settled at 5,989 -- down 133 points. According to PTI, the Sensex fell below the psychological 20,000 points level on Tuesday on frenzied profit -booking amid a weak trend in Asia, which also pushed the NSE's broad-based Nifty index below the magic 6,000-marker. 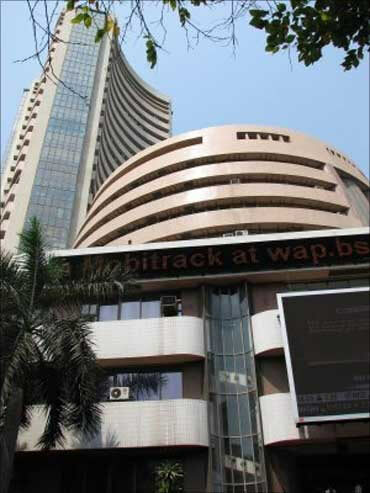 While the Bombay Stock Exchange benchmark Sensex fell by 457.19 points to 19,852.50, the broad-based National Stock Exchange index Nifty was down by 144.20 points at 5,977.40 at mid-session on speculation that central banks worldwide might raise borrowing costs to cool down inflation, constricting the availability of cash for equity investment. After a weak opening, selling pressure gathered momentum as leading Asian stock indices, led by Hong Kong and Japan, nosedived on concerns over the deepening Irish debt crisis. The regional index for Asian markets fell for the third straight session on Tuesday on speculation that governments will take further steps to cool down inflation, coupled with a decline in raw material prices. The MSCI Asia Pacific Index slipped by 0.2 per cent to 131.41 in Tokyo, with about five stocks falling for every three that climbed. "The markets are in a corrective mode because they are close to peak and valuations are expensive. "Until the Nifty holds above 6000 levels, the markets will be in a short-term correction mode, but will recover fast. "But, if the index breaches 6000 in coming sessions, it may touch 5900 and 5700 on the downside", says DD Sharma, senior vice president -- research, Anand Rathi. Asian bourses slumped as fears of a interest rate hike dragged the Chinese markets down 4 per cent. Investors were worried as any hike in interest rates in the world's second largest economy would slow demand for oil and metals among others. European markets are also trading in the red. The CAC is down 1.3per cent while FTSE has dropped 1per cent. Euro zone finance ministers will be considering ways of solving Ireland's debt crisis. 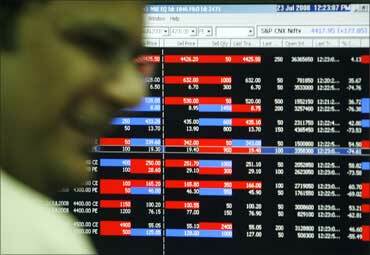 On Monday, markets in India had ended a volatile session with 152 points gain as inflation numbers came out. A 8.5per cent increase in inflation increases chances that the RBI would not change key rates any more in this financial year. The Centre for Monitoring Indian Economy has projected that the economy will grow at 8.7 per cent in the second quarter of 2010-11, marginally lower than 8.8 per cent in the first quarter. The CMIE states the growth to be 'remarkable' given that the growth is coming over a high base as the economy clocked a robust growth of 8.6 per cent during the corresponding period in 2009. New listing, Gravita ended with a 68per cent premium at Rs 210 against its issue price of Rs 125 a share. All the sectoral indices ended in red. BSE metal index dropped 3.5per cent on declining prices of metal stocks worldwide. Meanwhile, the London Metal Exchange, the guage for six industrial metals, including copper and aluminum, slid 0.3per cent in the previous trading session. Sterlite and Hindalco slid 4.5per cent each to Rs 174 and Rs 214, respectively. Jindal Steel slumped 3.3per cent to Rs 657. Tata Steel was down 2.3per cent. BSE realty, auto and PSU indices were down 2-3per cent each. Bharti Airtel bucked trend and gained 1per cent at Rs 313 following A Raja's resignation from the telecom ministry. Image: A broker sits near his computer terminal while trading at a stock brokerage firm in Mumbai. HRD Minister Kapil Sibal will now be handling the portfolio. "The intermediate trend is down for Bharti and RCOM. As a result, both counters may face selling pressure at current levels. The trend will turn positive only if the stock moves into a higher top higher bottom cycle. there are no such indications as such on the charts," says Shardul Kulkarni, Sr. Technical Analyst, Angel Securities. Larsen & Toubro was the biggest contributor in today's fall. The stock shed 3per cent at Rs 2,016. Tata Motors, Reliance Communications, Jaiprakash Associates, Tata Power and Reliance Infrastructure slipped over 3per cent each. ITC, Wipro, SBI, BHEL and ACC were among the Sensex losers. Some other stocks which ended in the red were DLF, Mahindra & Mahindra and Maruti Suzuki. Mahindra Satyam crashed 12per cent to Rs 74 on a sharp decrease in Q2 net. For the fiscal second quarter ended September 30, net profit narrowed to Rs 23.3 crore ($5.2 million) on sales of Rs 1,242 crore (Rs 12.42 billion). For the fiscal first quarter ended June 30, its profit stood at Rs 97.5 crore (Rs 975 million), on revenue of Rs 1,248 crore (Rs 12.48 billion). SKS Microfinance touched a new low on the BSE on Tuesday. The stock dropped 12per cent to Rs 799 on reports that micro finance institutions have stopped giving fresh loans in Andhra Pradesh amid restrictions from all quarters. Hindustan Copper ended near its 10-mth low on FPO price issue worry. The public sector undertaking is planning to raise Rs 4,000-Rs 5,000 crore (Rs 40-50 billion) by divesting a 10per cent stake. The stock dropped 4per cent to Rs 359. Market breadth was very weak. Out of 3,124 stocks traded, 2,398 declined while 624 advanced. Yeti, Aria and Santa Fe. Which is the best buy? Here's how CAG report on 2G scam blasts Raja!